Sara Ali Khan, touted to be the next big star in Bollywood has won the hearts of millions with her terrific performance in ‘Kedarnath’ and ‘Simmba’. Her beauty and humility has forced men to get down on their knees but her heart beats for ‘Mufti’ model Kartik Aaryan. 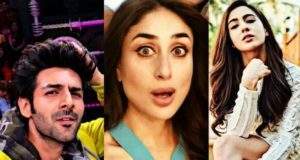 Sara who made her debut with her … Continue reading What does Kareena Kapoor Khan know about Kartik Aaryan and Sara Ali Khan?